I have learned to trust book recommendations from authors I love. Patrick Rothfuss led me to Catherynne Valente and to Peter S. Beagle. Now it’s time to trust Rick Riordan. 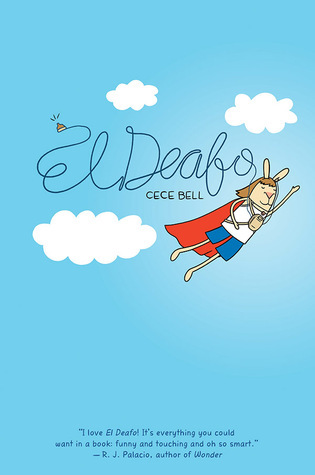 Cece Bell tells the story of a young girl (rabbit?) growing up with a severe hearing impairment. She does a great job tackling the subject with humor and pathos, letting us see the world through the narrator’s eyes (and hear through her super Phonic Ear). Along the way, we meet pushy friends, clueless peers, helpful teachers, not-so-helpful siblings, and a whole cast of other characters that any kid can relate to. Raina Telgemeier is the author and illustrator of several excellent graphic novels that you absolutely have to read. SMILE was her first and it’s her story of a terrible fall that caused her to lose her front teeth, but also about what it’s like to go through school when you’re also dealing with heavy dental surgery. DRAMA was her second, all about a high school drama class and the somewhat awkward search for relationships there. SISTERS is her most recent and it’s about…well, just watch the video below and she’ll tell you all about it. Time travel. Rocket ships. Wizards. Dystopias. You will meet many people in your life who look down on “those kinds of stories.” They are the serious types. They believe in their serious literature. We can let them believe in that. They can have their stories about sad people in sad cities. Because, honestly, we read those books, too. Every now and again, we need a palate cleanser, a waystone that lets us step back into our own world. The deep truth is this: we like other worlds. We like worlds that don’t already exist. Besides, the biggest milestones of human storytelling tend to be about magic and dystopias. The Odyssey is full of witches and sea monsters and Cyclops. Beowulf fought a dragon. Shakespeare filled his plays with ghosts and wizards and prophecy. Mary Shelley brought the dead back to life. Jules Verne sent humanity to explore the moon long before John F. Kennedy was born. Reading fantasy and science-fiction connects us to the roots of the world. The desires to explore and to escape and to imagine are built into us. So go ahead and dive into sci-fi and fantasy. But don’t be afraid to dip your toes into realistic fiction, either. There’s excellence to be found there, too. Gayle Forman, author of If I Stay, just put out an article in TIME magazine. She dives head-first into tackling a tough topic: why do teens prefer literature that explores darker topics like war, abuse, and mortality. In other words, it’s more than likely that teen brains are more receptive to stories that trigger intense emotions. John Green does an awesome video series in which he plays video games and talks about life at the same time. In this episode, he discusses the many methods of writing a novel. I know that more than a few of you have made a stab at writing a novel, and if you have, you know what it’s like to spend an hour or two at the keyboard, followed by the realization that you’re going to have to delete everything you wrote. He drops a lot more wisdom (and discusses how The Fault in Our Stars changed over time).